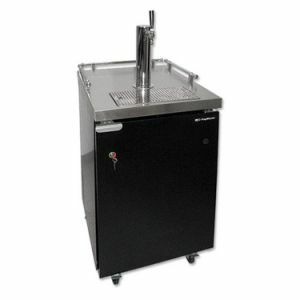 The UBC KegMaster Commercial Kegerator combines high-grade materials and quality components to provide reliable, convenient draft beer cooling and dispensing. It features a heavy-duty commercial grade 1/5-hp compressor and 2-inch thick foam-in-place insulation that ensure efficient cooling. The rugged stainless steel interior accommodates 1/2-barrel, 1/4-barrel, 1/6-barrel and home brew kegs.